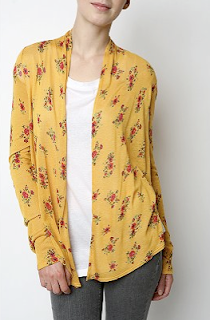 Samantha asks: "Can you help me find where Taylor Swift got this yellow floral sweater she is holding in this picture." I love Taylor Swift's fashion sense. Thanks for posting this. I am such a huge fan of Taylor Swift. I recently saw her at pinkberry and I almost died!! Her style is so awesome....I noticed she was wearing a colorful/graphic tee from the brand remetee....i need more info on where to get this shirt because it was so cool and if taylor wears it then it must be cool.any ideas on where to get it??? I love her fashion sense so much!